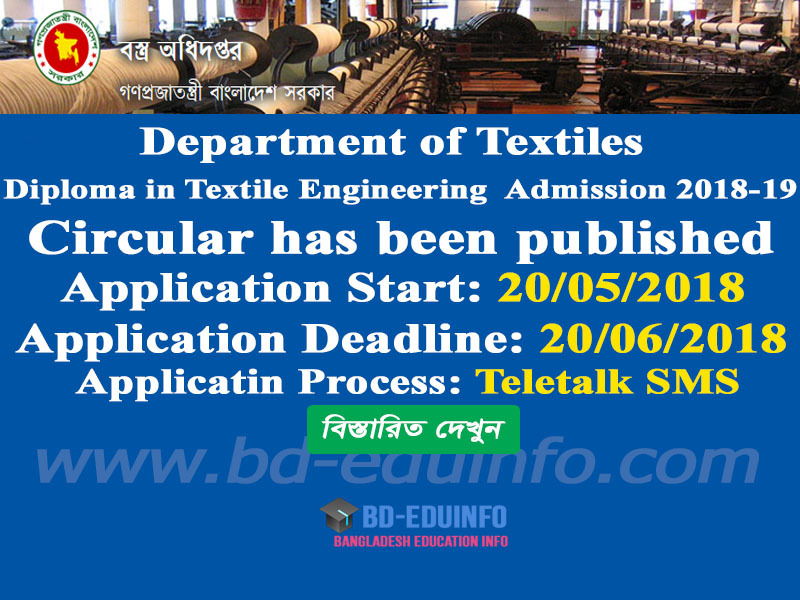 Department of Textiles Circular Diploma in Textile Engineering and Diploma in Jute Technology Admission circular 2018-19 has been published on http://www.dot.gov.bd/. All Students will have to apply through online and pay admission fees through mobile SMS. Diploma Polytechnic Admission Circular 2018-19 will be found here. SSC/equivalent in 2016, 2017, 2018, they are eligible for diploma admission 2018-19. All Students must have GPA 3.5 over all and GPA 3.0 in Mathematics. Candidate can apply online and SMS system. Applicants can apply online official website http://www.dot.gov.bd/. At First Students must pay fee 300 taka 24 hour before online application. Application Fee pay by Teletalk Mobile. Applicant will get a massage along with Money receipt. You Must Keep Money Receipt Number for Further Query. Replay Massage send Applicant Money receipt Number for Further Query. Tags: textile engineering courses, textile engineering colleges, diploma in textile engineering. 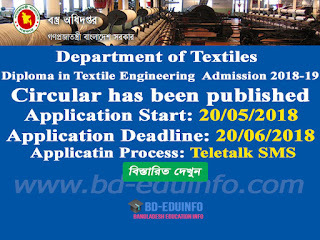 diploma courses, textile engineering, bsc in textile engineering,about textile engineering, what is textile engineering, college diploma, www.dot.gov.bd, www dot gov bd, diploma in textile engineering bangladesh, diploma in textile engineering result, diploma in textile admission 2018-19.
textile engineering courses, textile engineering colleges, diploma in textile engineering. diploma courses, textile engineering, bsc in textile engineering,about textile engineering, what is textile engineering, college diploma, www.dot.gov.bd, www dot gov bd, diploma in textile engineering bangladesh, diploma in textile engineering result, diploma in textile admission 2018-19.